Serving Houston & Harris County for over 33 years. Bada Bing Bail Bonds in Houston offers fast, affordable bail bond services to Houston and Harris County Texas. We are very competitive and offer easy payment arrangements. We are conveniently located close to downtown with free parking and a friendly staff, and we are here ready to help you 24 hours a day seven days a week. Making arrangements for bail bonds in Houston for over 33 years the owner Jack Meyer is always available to speak with you personally about you individual needs. 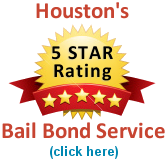 Obviously, we would like to be the bail bond company in Houston you choose to do business with and helping you is our #1 priority. We are proud to say that we have a 5 star rating across the web and invite you to read our testimonials to see what our customers have to say about us. No red tape - we're ready to make a deal for your bail bond needs! The following links provide valuable information that may help in the decision making process and in deciding which bail bondsman in Houston you want to do business with. For most people finding out that someone is in jail or finding out an open warrant of arrest exists is traumatic; we try to take the fear out of it, and getting reliable information helps. Our website offers the most comprehensive information concerning getting someone out of jail in Houston that you will find anywhere else. We explain everything in detail so if you are wondering why it takes hours and hours to get someone released from jail in Houston and want to find information we provide it here. Give us a call today. Do you need answers to questions or do you want to know how the bail bond process works? Visit our Frequently Asked Questions where we give general information about getting someone out of jail and about posting bond for open warrants for felony, misdemeanor, and traffic ticket bail bonds in Houston. You can also view Types of Bonds to determine what may be specific to your individual need.